This study conducted by Ecologic Institute with support from the Heinrich Boell Foundation aims at providing factual background to the debate on regulatory cooperation within the TTIP. The study looks at whether fears are justified that regulatory cooperation could lead to lower levels of protection in the EU and the US and parliamentary processes being bypassed. The study is available for download. In the discussions about the ongoing negotiations on a Transatlantic Trade and Investment Partnership (TTIP) between the EU and the US, one of the central topics and a subject of great concern is regulatory cooperation. Regulatory cooperation is supposed to bring gains in efficiency and thus economic benefits. At the same time, the prospect of changes to standards, e.g. of environmental or consumer protection, raises concerns that regulation would be harmonised at the lowest common denominator or that existing levels of protection would be undermined. The authors provide an overview of existing models for achieving regulatory harmonisation, with a focus on mechanisms already used between the US and EU, in trade agreements with third countries, at the multilateral level with US and EU involvement, and some particularly far-reaching examples of regulatory cooperation. The study also contains a brief overview of regulatory processes within the US, the EU and Germany in order to clarify which affairs are normally decided in a parliamentary law and which are delegated to other entities like agencies or ministries. Finally, the concept of a Regulatory Cooperation Council, as proposed by the Commission for TTIP is discussed. Such a body would be tasked with initiative for improving regulatory consistency between the US and EU; the EU side would be represented by Commission officials. The effect of any agreement on regulatory cooperation will depend on what precisely is agreed and how the agreement is implemented. However, the study concludes that the conditions for international regulatory cooperation are usually defined with a high degree of precision in formal legislations; for example, EU legislations contains rather well-defined requirements and procedures for the recognition of a decision taken in another jurisdiction as equivalent. Thus, the autonomous decision-making space of the Commission in implementing decisions taken in a Regulatory Cooperation Council or a similar institution would be very limited. In addition, the most ambitious tools of harmonization which could imply a lowering of the level of protection are rarely used in practice; many agreements concluded under the heading of mutual recognition give the Parties a lot of freedome to decide if products from another country are recognized as equivalent or not. The study concludes that there is a low risk that TTIP would create institutions, such as an EU-US Regulatory Cooperation Council, mandated to take decisions that could bypass national or EU legislative procedures or would lead to weakening these processes. However the authors consider some aspects of the current EU proposals for regulatory cooperation as problematic: This relates to a proposed requirement to assess future regulatory action with a view to its impact on trade as well as the idea to consult trade partners on EU legislative proposals at the stage before they are officially adopted and published. The Ecologic Institute's authors argue that such mechanisms in TTIP would unduly privilege trade interests over other interests such as environmental or consumer interests. The study also points to concerns over the democratic legitimacy of a too strong involvement of the executive in regulatory decision-making, in particular when certain stakeholders, notably business communites, are more heavily involved in such decison-making than others. This may also become a critical point for mechanisms for regulatory cooperation created under TTIP. The authors also favour a more informed debate on the issue and ask the relevant actors to make the details of their plans on regulatory cooperation in TTIP transparent as soon as possible. Stakeholders, policy-makers and experts were given the opportunity to comment on a draft of the study during a discussion organised by the Heinrich Böll Foundation on 17 June 2014 in Berlin. On that occasion, Christiane Gerstetter, the study's main author, presented central results. Investor-State Dispute Settlement and TTIP – Threat or Opportunity? 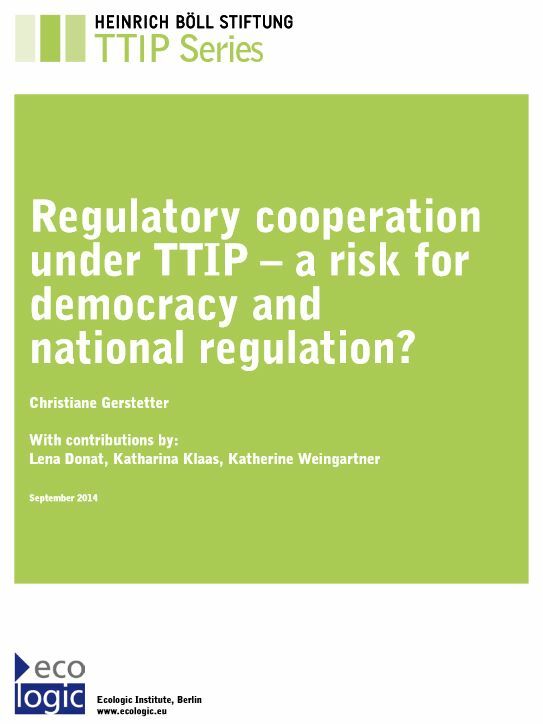 Gerstetter, Christiane; Lena Donat; Katharina Klaas and Katherine Weingartner 2014: Regulatory Cooperation under TTIP – a Risk for Democracy and National Regulation?, Berlin.